Prepare to be challenged and amazed by this new guide in the popular "Cover to Cover Bible Study" series on "Acts" chapters 1-12! Ideal for group and individual study, the seven sessions cover topics such as the wind beneath our wings, God's at work, Church on the move, Gospel explosion and God writes a new chapter. Written by Christine Platt, author of a number of other guides in the series, each session will take 1-2 hours to complete and consists of an opening ice breaker, Bible readings, insightful notes from the author, thoughts and questions to stimulate discussion and suggestions for personal application. There are also helpful suggestions for group leaders on how to introduce and lead each session. There are now 40 titles within this "Bible Study Guide" range. 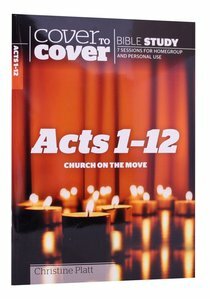 About "Acts 1-12 - Church on the Move (Cover To Cover Bible Study Guide Series)"
Week 4church On The Move!